Every day, Watch This offers staff recommendations inspired by a new movie coming out that week. This week: With Richard Gere playing a desperate derelict in Time Out Of Mind, and the excellent Heaven Knows What new to Blu-ray, we look back at other films about homelessness. 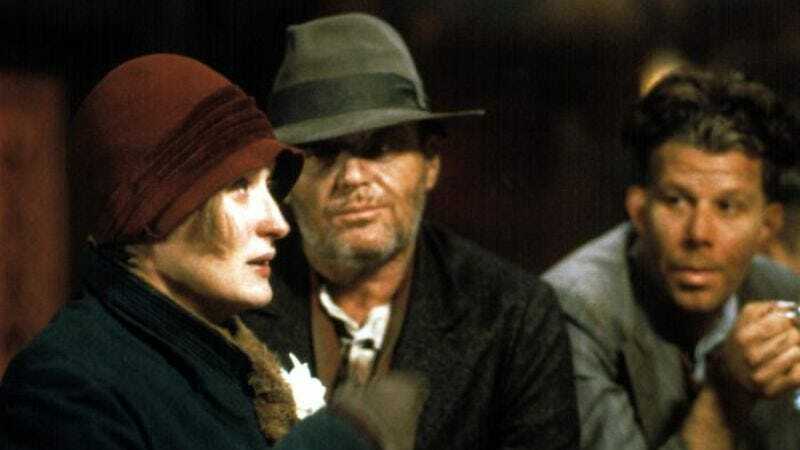 Ironweed wastes no time in establishing the weight of its sadness: Very early on, Francis (Jack Nicholson), a Depression-era bum poking around his hometown of Albany, New York, visits the grave of his long-gone infant son. The baby died just days old when Francis dropped him, and it becomes clear that this moment is about when Francis checked out of his family life. Now a middle-aged man, he wanders the streets, sometimes meeting up with Helen Archer (Meryl Streep), who functions as sort of a common-law wife and partner in scraping by. Streep and Nicholson don’t spend that much time together on screen; director Hector Babenco and screenwriter William Kennedy (adapting his own novel) follow both characters, together and apart, over the course of a few days. Streep’s role is very much in her ’80s prestige wheelhouse, but this is a bigger departure for Nicholson, who was beginning to take more persona-heavy roles around this time, with Witches Of Eastwick and Broadcast News coming out the same year and Batman just around the corner. He has flashes of that devilish Nicholson charisma, but in this context, of course, it seems sadder—especially when it becomes clear that Francis’ sorta-former, sorta-current wife Annie (Carroll Baker) would take him back in, if he could bear it. His problems, like those of the other people he knows from living on the streets, aren’t limited to homelessness; everyone in the movie seems to be suffering from one ailment or another, be it cancer, tuberculosis, or alcoholism. Ironweed asks a lot with its 140-plus minutes of low-key suffering. It feels long, in part because not a lot happens from a plot perspective. Still, its strongest moments linger. When Francis looks into his grandson’s room, Babenco keeps the frame empty of people, and the camera floating forward looks like the POV of a ghost. The movie in general has a ghostly tone—a sense that Francis is haunting his hometown, not living in it. Both Francis and Helen experience visions, of sorts: Francis sees people he has wronged, inadvertently or not, in the past (further explained in a few flashbacks), while Helen’s singing at a bar transports her, however briefly, into a full fantasy sequence. Though the film’s period is long past, Ironweed is less about the Great Depression than a state of mind. The characters are living on the streets, but spend just as much time in their own heads. Availability: Ironweed is available on Blu-ray and DVD from Netflix or possibly your local video store/library. It’s also available to rent or purchase digitally through VUDU.